Continuing with the off-ice official opportunity which has come my way this year, was something I had hoped for after a taste of it earlier this year. I’d expressed as much to the crew chief for the off-ice officials and on Friday night he arranged for me to assist in the time-keeper’s box. This was a great experience. I must admit I was immediately considering the practical; whether I could make it over the ice to the box without falling on my dignity. Fortunately, I had on Skecher non-skids to keep me erect. It’s even more fun, as you’re going out to the box when the good natured fans surprise you with bangs on the glass as you pass them. I guess everyone loves a pratfall. My fellow travelers mentioned to me that the ice was especially slick after the Zamboni had finished its work. Indeed, the between periods intermission was extended to a certain extent because of excess water from the ice resurfacing that hadn’t frozen. I did manage the entire game without falling to the ice, though, and that at least kept my dignity intact. Keeping time is more than just starting and stopping the clock. That has to be done in concert with events being conducted throughout the game. There are time outs (in the vernacular called “TV timeouts”) where the red light comes on, events happen up in the stands, supplemented by the audio and video support, and are over in one minute, ten seconds. This happens three times a period, all smoothly choreographed to the fans. Also, these have to happen in prescribed time windows of stoppages. There are also the penalties to keep track of. Again, there’s more to this than just putting up the two minutes and letting it run. Sometimes you don’t even know when a penalty starts, like a ten minute misconduct following a two minute minor. It can start at a different time if there’s a goal during the minor, as happened while I was there. This is important to transmit to the penalty box official who will let the player out when appropriate. Then there’s the announcer – having to inform the fans about the events of the game, the penalties, power plays and goals as well as sliding in an entire litany of fan participation events (guess the attendance, 50/50 raffle winner, hockey equipment raffle winners. The entire thing is a scripted show where everything has to get into the show, but nobody is precisely sure when. The work between the time-keeper and the announcer has to run smooth. Then there are the duties of the penalty box officials. They have to do more than just open and close the door for the players caught with their hands in the cookie jar. The pucks to replace those going into the stands are there to support the on-ice officials, as are the towels and water bottles for these guys, who skate all the time (shifts? What’s a shift? ), except at the TV time-outs. They also get to be the place where broken or abandons sticks are brought. Hopefully they can open the door, get the stick all the way into the box and get that door slammed shut before the players barrel into the dasher. My night in the box was a little different in that Reading scored on four consecutive power plays. The penalized players were going through a revolving door on the box. The penalties lasted 8 seconds, 6 seconds, 19 seconds and 35 seconds. This led to the obvious question as to the personal hygiene regimen of that box’s official failing him. Nobody wants to stay with him? All in good fun. He finally had someone who stayed with him for a while when #74 for Cincinnati, Brandon McNally, got two minutes and a ten minute misconduct. Then we all heard the chirping fans. “You’re spending more time in the box than on the ice”, “You’re time is almost up, but don’t worry, you’ll be back” were heard out of the fan base behind us. And #74 leaned over to the official and told him quietly, that the fan was probably right. In recording the penalties and goals, I ran out of room for the goals. They were put up in blank lines in the penalty area. Also, there are corrections for assists and goals. Who touched the puck and when? Was there a tip-in at the front of the net? These guys try their best to get it right, by reviewing video between periods. So sometimes additional assists are given and the goal scorer could even change. 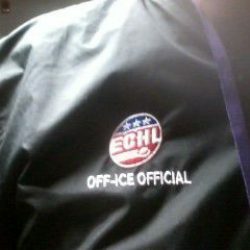 These things are all in a day’s work for the off-ice officials. These guys love the game, work diligently, and make the whole show enjoyable for us all.